Unable to find a race seat for his F1 return, Jaime Alguersuari has signed up for a season of kart racing. Spain's El Confidencial reports that the former Toro Rosso driver will combine his continuing role as Pirelli test driver with a seat in the powerful KZ kart category of the European championship. "The truth is that I miss competition and so I will compete in what most resembles a Formula One car," said the 22-year-old. "I don't know if I will return to Formula One but I don't want to believe that my career is over at twenty two," added Alguersuari. 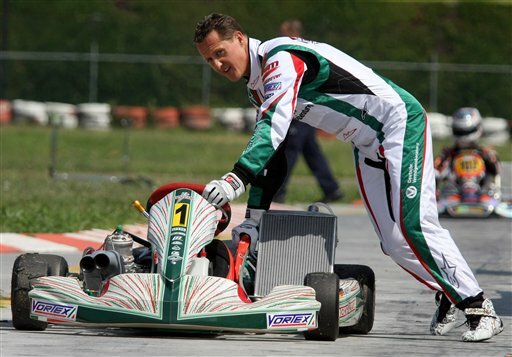 It has also emerged that the newly re-retired Michael Schumacher is returning to kart racing, and will contest the WSK Euro Series race at Ialy's La Conca circuit for Tony Kart. Curiously, one of his competitors this weekend will be Max Verstappen, the 15-year-old son of his former Benetton teammate, Dutchman Jos Verstappen.